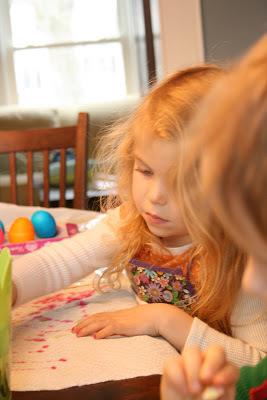 This past weekend we decorated Easter eggs. 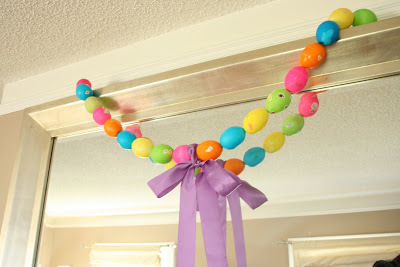 I blew out 18 eggs so we could make our egg garland. We used those eggs to make dutch babies and omelets for Sunday brunch. Stella was in charge of dying the eggs. Lucas was in charge of putting on the stickers. 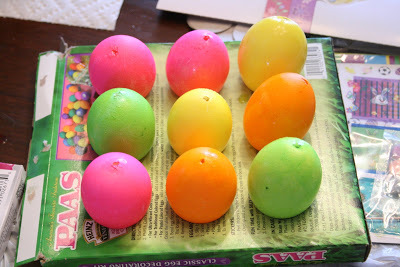 Then I strung the eggs with ribbon. And voila! It is now adorning our fireplace mirror. 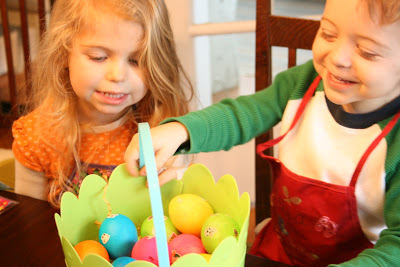 Stella and Lucas look like they had lots of fun decorating eggs. I like your door decoration, too. How fun!!! 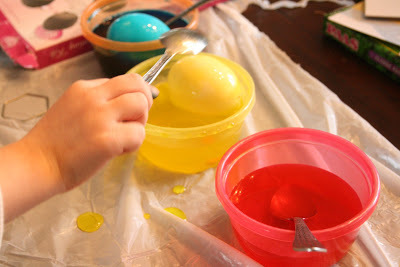 That is such a cute idea…dumb question, though, how do you “blow out” eggs? Not sure what that means. Hey you! We missed Stella today. I waited around until one and then left to run errands. Are you okay? Would love to have her over sometime. So cute!! You are definitely a fun mom –love the Easter feeling in the air! Beautiful.